Mama Mia! Here I go again. My, my, how can I resist you? 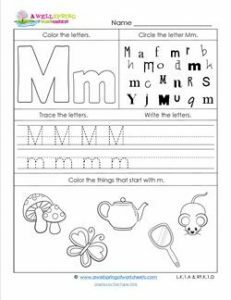 Letter m in these alphabet worksheets, how can I ever let you go? No, no, I won’t, I won’t! I’ll print you out so my kids can practice their alphabet skills. I’ll make copies so everyone is sure to get one. We’ll work on it together and we’ll circle m’s and color in. We’ll trace and write and never part. We won’t be blue or brokenhearted. We’ll just have fun singing and practicing the alphabet forever!